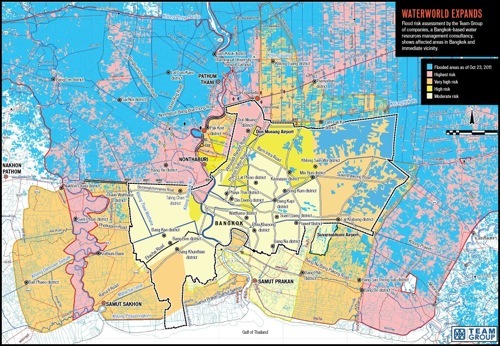 Inner Bangkok largely remains dry, but flooding continues to affect other parts of the city, especially in the north. 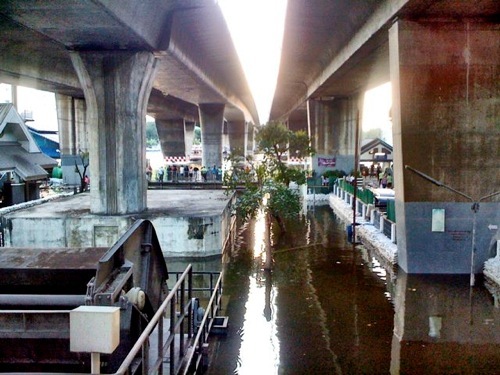 The Thai government was forced to move its flood relief operations away from Don Muang airport due to flooding there, but the Thai prime minister said today Thailand’s flood waters are beginning to recede. 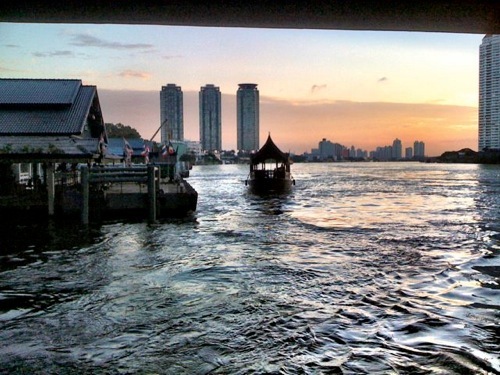 High tides this weekend have pushed the Chao Phraya river to record levels. See below for some images I snapped today downtown. No surprise here: the river was quite high. Chinatown and the the area around the Grand Palace was largely dry. Though there were sandbags piled in the Grand Palace’s doors, any recent flooding must have receded. I noticed a few large puddles one street nearby. Here’s a good map, via Richard Barrow, of the current state of affairs. 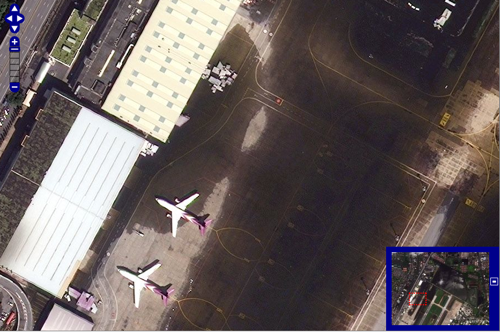 Meanwhile, thanks to reader J for sending along a link to some vivid images, below, from the National University of Singapore’s Centre for Remote Imaging, Sensing and Processing. The rest of the images are available here. Elsewhere, Bangkok Pundit points out this map from Chulalongkorn Univ. 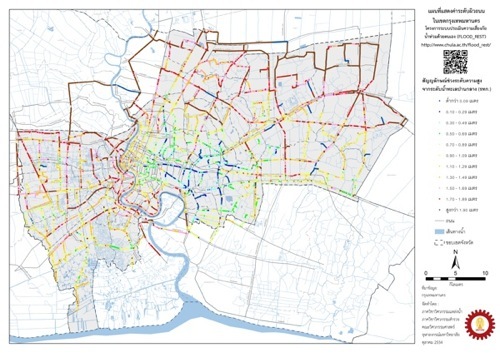 that shows the elevations of Bangkok’s roads. A larger — and very large — image is here. Defenses shielding the center of Thailand’s capital from the worst floods in nearly 60 years mostly held at critical peak tides Saturday, but areas along the city’s outskirts remained submerged along with much of the countryside. Prime Minister Yingluck Shinawatra said the floodwaters have started to recede after killing almost 400 people, submerging entire towns across the country’s heartland and shuttering hundreds of factories over the last two months. She urged citizens to let the crisis take its course as the floodwaters slowly drain to the sea, with Bangkok lying in their path. Thai authorities abandoned their crisis operations center at Bangkok’s old international airport Saturday because of rising floodwaters as soldiers and volunteers raced against to time to shore up the city’s defenses against a massive flow of water that has already inundated parts of the capital and a vast swath of countryside. Swelling high tides on the Chao Phraya River that winds through the heart of the city make this weekend critical. Rising water levels sweeping in from the Gulf of Thailand already are flooding riverside districts such as Bangkok’s Chinatown and making it difficult to channel floodwaters from upstream out to the ocean. The tides are expected to peak this weekend. Receding floodwaters north of Bangkok have reduced the threat to the Thai capital, the prime minister said on Saturday, but high tides in the Gulf of Thailand will still test the city’s flood defenses. “If things go on like this, we expect floodwater in Bangkok to recede within the first week of November,” Prime Minister Yingluck Shinawatra said on national television. And finally, although it’s a few days old, here’s a characteristically excellent photo roundup of the Thailand floods from The Atlantic‘s In Focus blog. To reiterate: I can’t answer emails and tweets asking for travel tips. Things can change quickly, and no one can predict exactly what will happen in the days and weeks ahead. 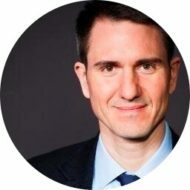 See my previous posts for links to a few articles with travel tips and resources. 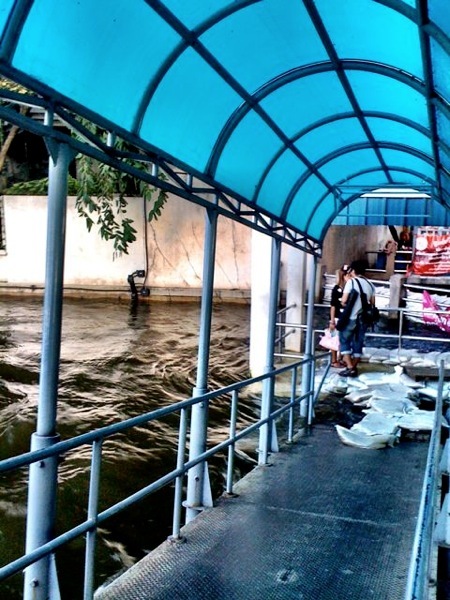 Thailand flooding update October 28, 2011: Minor flooding hits Grand Palace and outer reaches of Sukhumvit Rd. I didn’t know that is will happen to thailand. I’ve already been book a flight to thailand during thanksgiving holiday. 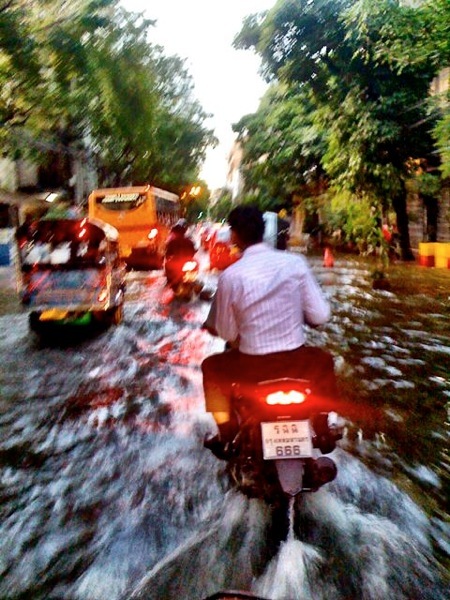 When I heard of about the flood I am concern about how am I going to get there safe? I’m worry, because I plan to connect the flight from bankok to Laos. I would like to get more information about the flight during that time okay..thnaks ..